You are at:Home»Automotive»Is Now The Time For Lightweight Brakes? Is Now The Time For Lightweight Brakes? Lightweighting is a daily topic in the automotive blogs and news reports. The auto show news speaks of a SUV that lost 700 pounds. Each day a new material alternative is presented with projections on how much weight it will save with the environmental and fuel economy benefits. The upcoming corporate average fuel economy (CAFÉ) requirements as stringent as ever, so one would think that all of the components on mainstream light duty vehicles are going on a diet. Every part? Well, let’s start with the high impact parts, those with more than one per vehicle. And, let’s look at those in the highest value category, the unsprung mass and the rotating mass. And, those that use a high-density material like cast iron. So, what component fits all of these categories – the brake rotor! Yep, four per vehicle. A heavy, unsprung, rotating mass! Would the pressures of CAFÉ put the rotors on a diet? Lightweight brake rotors are not an original idea. Back in the 1950’s, researchers began to develop aluminum composite materials that were billed as the new brake material. Light in weight with ceramic reinforcement seemed like a good idea. In the light-weighting push of the early 1990’s, some say over $200 million was spent on aluminum composite brake rotors and the only application that reached the street was the rear rotor on the Plymouth Prowler. In the 90’s and up to today, these lightweight brake rotors have come in many forms. The metal matrix composite (MMC) made by stir casting a homogeneous mix or by infiltrating a ceramic sponge, called a preform, via squeeze casting. Others have tried coatings on an aluminum cast core. Others have tried iron wear plates on a cast aluminum core. For the MMC’s, the challenges are three-fold: cost, temperature and friction. The cost of an iron rotor is very low and comparing to the cost of aluminum and the ceramic reinforcement. With the aluminum matrix, the maximum operating temperature is a challenge with today’s alloys, and because brakes work as a friction couple, a compatible friction material must be developed in parallel. The coated and iron-skinned designs would use today’s bountiful friction options. Putting this all together in a business case to reach the masses hasn’t happened. Can it happen? 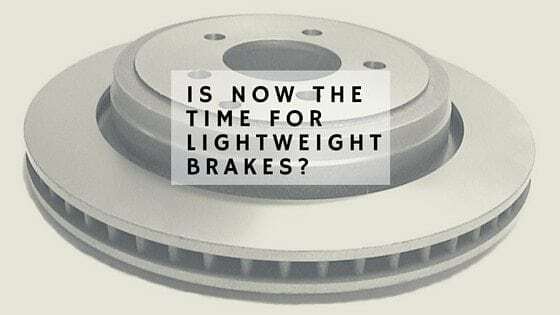 Think of the giant gap between ferrous brake rotors and carbon rotors; the former are low cost and heavy, the latter are lightweight and expensive. MMC’s and coated aluminum would be much closer in cost to iron, yet at weight reductions comparable to carbon rotors. Will the pressures of CAFÉ provide incentive to bring the lightweight brakes to fruition?